What are the Pros and Cons of Single-Cup Coffee Makers? How much coffee to use and make? If you are passionate about coffee, you want it to be fresh, hot and tasty. Some of the best single serve coffee makers can make this happen. They allow you to choose between different flavors, brewing temperatures, and cup sizes in order to get the experience you want. If you are tired of waiting in lines, these single-cup coffee makers might be a perfect solution for you. Each of the reviewed products has some unique features. However, there are some common features for you to consider, when looking for your best single serve coffee maker. You want to make sure that your coffee maker fits into your home, office or a room. Since the size can vary greatly, it’s good to check it out in advance. Not all coffee makers use the same type or size of coffee pods for example. Some single-serve coffee makers can also make other types of coffee. You don’t want to worry about your coffee maker. That’s why it’s important to know if there is an automatic shutoff button and if you can program the coffee maker in advance. The Keurig K575 belongs on the list of best single-serve coffee makers for a reason: it gives you lots of options to make your coffee exactly as you want. It comes with multiple K-cup pod brew sizes and gives you control over the brewing strength. Depending on your taste, you can brew a bolder cup of coffee using any of the pods available. This particular coffee maker also has different temperature settings. You can decide how hot you want your coffee to be and adjust the level in advance. The Keurig K575 has a rather large water reservoir so that you can make more than 10 cups of coffee before having to refill it. This is a good choice for those who want to save time and experiment with different brewing sizes. If you are very specific about your coffee, this might be a good choice. You can adjust multiple parameters to get the desired output. To sum up, this is a good coffee maker for those who like to experiment with the strength of their coffee. You can use different K-cup pod sizes and control the temperature and the strength to make your ideal cup of coffee. Here is another very convenient model for brewing coffee. It takes up very little space on the counter which is why it may be a good solution for offices, dorms or even camping trips. The CHULUX K-Cup single serve coffee maker suits most of the K-cups and filters. It is easy to use – you just have to insert the pod, press the button and the coffee will be ready in 3-5 minutes. There is an auto-shutoff system after 3 minutes, so you don’t have to worry if you forget to turn it off. Removing filters is simple and quick, with no mess afterwards. This model might be a great choice for people who want to get good coffee and also save some space at the same time. If you live in a small space such as a student dorm, you might consider this model. Also, this suits people who want to spend little time brewing coffee. If you value efficiency and simplicity, then this is a model to look at. It’s highly practical, even for those who are still new at brewing their coffee. Its simplicity and high level of coffee quality rightfully put it on the list of best single serve coffee makers. The Aicok single-serve coffee maker fits most of the single cup pods (this includes K-cup pods as well). It can operate with a reusable filter, although the filter itself is not included in the package. The usage is quite simple – there is a single button you should press to make your coffee. The temperature is high enough, so there is no need for you to put the cup in the microwave to heat it up further. To ensure safety, this model also has an automatic shutoff system. If you’re looking for a coffee maker that will save you space, this might be another good model to check out. It is very light in case you need to move it, plus it takes up very little space on the counter. It can be a very good solution for those who love to travel often as well. This is another simple and practical coffee maker, perfect for those who are on the move. The Keurig K155 has a very modern design, with a full-color LCD touchscreen. It allows you to adjust the brewing temperature or program the auto on/off setting. The water reservoir is quite large, so you might be able to make up to 18 cups of coffee with a single fill. In that sense, this particular coffee maker is great for offices, not to mention that Keurig markets it as a commercial coffee maker. The reservoir is also removable and, therefore, easy to refill. Although this is a slightly larger model and takes more space on the counter, it is easy to move. In that case, you can easily drain the internal hot water tank. The Keurig K155 is a commercial-grade single-serve coffee maker. It does require more space, so it might be better for offices or other workplaces. Again, this is a very safe choice for busy places. It ensures variety in brewing sizes, as well as high control over the process itself. This model enables you to make either a single cup of coffee or a full coffee pot. It uses both ground coffee and pre-packaged soft pods. Another important feature is that all mug sizes can fit this model. It has advanced programming options, so you can set the exact time for the brewing to start. If you enjoy roasting your own coffee beans, then this model might be good for you. Also, if you want single serve without giving up drip coffee, this Hamilton Beach model can be a great solution for you. Look no further if you want a single serve coffee maker that can also make drip coffee. The Cuisinart SS-10 single serve coffee maker is a K-cup compatible brewer and makes one cup of coffee at a time. It is fully programmable and accommodates different beverage sizes. It also has a hot water button which is useful if you want to make another instant beverage such as cocoa or hot chocolate. Again, you won’t have to worry about refilling the water reservoir too often with this model since the water reservoir is rather large. If you like to experiment with the way you prepare your coffee, this model might be good for you. It has a variety of options in terms of brew size, strength, and temperature which is good for people who like to tinker. This model is also a bit bigger, so it might not be a good option for smaller places. If you need a coffee maker that heats up and brews quickly, yet deliver good quality, this might be the model for you. You can also use its hot water function to make drinks other than coffee which can be convenient at times. This is a drip coffee maker which works differently than all of the previously reviewed coffee makers. It uses ground coffee and brews directly into a 14oz travel cup. This model is easy to carry and takes up very little space which can be quite useful. Additionally, it automatically maintains temperature level so that you can enjoy good coffee quality. It has an auto shutoff system, so you don’t have to worry about it if you are in a hurry. This is great model for those who want a light and portable coffee maker. If you enjoy using ground coffee instead of pre-packaged coffee pods, this can be a perfect solution. To conclude, this is a very good model for the price, plus it is very practical. It’s a great option for those who enjoy the taste of freshly ground coffee beans. Here we have one more pick for our list of best single serve coffee makers, powered by Keurig Brewing Technology. Thanks to this partnership, this particular model can use a variety of K-Cup pods for coffee, tea or hot cocoa. It offers 3 different brewing sizes. It’s fair to say that this is a mid-size coffee maker with water reservoir large enough to cover a few cups of coffee before having to refill it. If you are a fan of K-Cup pods, this is a good model for you. While it doesn’t offer as many options as other similar models, you can still choose between different brewing sizes. It’s good both for your home or your office. This single serve coffee maker gives you just enough options to enjoy the variety of K-cup sizes and flavors. It’s very convenient both for home or office use. If you’re looking for variety in brewing options, this could be a good choice. One of its useful features is that it brews K-Cups, tea bags, ground coffee, tea pods, and soft coffee as well as loose tea. Another important feature is the Pulse Brew option for those who enjoy bolder flavor. It is fast and reliable. More importantly, you can make a wide spectrum of beverages with it. This specific model is great for those who love coffee and other hot beverages. Since it has advanced brewing options, the price is also slightly higher compared to other models in review. Therefore, it is a good choice for those with bigger budgets. The BUNN MCU single cup coffee maker is very fast and lets you make more than just coffee. It is a good choice for both tea and coffee lovers. Here is another coffee maker compatible with numerous K-Cups. One of its cool features is its energy efficiency. It won’t cost you a lot and you will still enjoy quality coffee. In addition to money, it saves time as well because it needs less than a minute to brew. As with other similar products, you can use its hot water for other types of hot beverages. This is a great model for those who want to save some energy and get their coffee fast. This model also takes up space which is something to have in mind. If you are busy and don’t have a lot of time for brewing, this may be a perfect choice for you. To wrap up, this model saves both energy and time. It’s very safe and durable. Plus, you get to enjoy a variety of tastes. If you’re new to the world of coffee, you might be confused with the different terminology. Single serve coffee makers produce enough coffee just for one cup at a time. They are smaller in size and fairly simple to use. Also, there is no additional waste and the brewing time is quicker. This might be a good option for those who enjoy having their coffee fresh but don’t have too much time to prepare it. For example, this could be a good solution for your home or workplace. Additionally, these coffee makers are usually more affordable. However, if you are looking for a coffee maker for larger offices or busy places, these might not be the best solution for you. In that case, you might want to check out coffee-pot makers instead. There are lots of reasons why even the most passionate coffee lovers prefer some of the best single serve coffee makers over everything else. Here are some of the main factors to consider when buying a new coffee maker. Freshness: Coffee from a single serve coffee maker is always fresh. Since you can’t make more than one cup of coffee at once, you don’t leave extra coffee and it doesn’t get cold. Additionally, if you can adjust the temperature of your coffee on the coffee maker, you can drink it immediately. Quick brew: Another great benefit is the brewing speed. Usually, it takes only a few minutes for the coffee to brew. If you are using K-Cup coffee makers, you just have to stick the pod in and wait for a few minutes. The coffee maker will do everything and you can enjoy a good cup. This is a big benefit for those who have just a few minutes to make their coffee. Quality: Coffee from a single serve or single-cup coffee maker is usually quality. You can roast your own beans or rely on pre-packaged K-Cups. Waste reduction as it brews one cup at a time: If you have experience with drip coffee makers, you know that there is always some coffee wasted. Oftentimes, it may also be messy which can be frustrating. With this type of coffee maker, however, that waste is reduced. Ideal for offices: This might be one of the most important features for people who work a lot and want to enjoy their coffee during work hours. Since most single serve coffee makers take up little space, they are great for offices. Also, they are fairly simple to use, which is another major benefit. More choice in flavors: Those who love to experiment with their coffee definitely enjoy the benefit of numerous flavors. Since pods usually come in different flavors, you can try out new things every day. The price range of these coffee makers can vary. The more brewing options they have, the more expensive they get. However, it all comes down to what you need. If that’s a simple single-cup coffee maker for daily usage, there are very good models with reasonable prices. If, on the other hand, you need something more professional, you will have to pay more to enjoy additional brewing options. Unfortunately, costs don’t end once you buy your coffee maker. When deciding on your ideal model, make sure to check how much power it will use. Also, some more advanced coffee makers will need certain equipment that can be costly. This shouldn’t discourage you since most single serve coffee makers don’t cost a fortune to buy and operate. If you are always on a tight schedule, you want to make sure that your coffee is ready in no time. Brew speed can also vary a lot. You can have your coffee ready in as little as 2 minutes if you go with a basic K-Cup coffee maker, for instance. However, if you plan to roast your own coffee beans, that may take a while. Both options have its benefits and your job is to make sure you find the best one for your needs. This is another important factor. Imagine having a day off and enjoying longer sleep when your roommate suddenly starts roasting coffee beans. Chances are you won’t get to sleep after all. This is to say that some of the coffee makers can be quite loud. If you are using it in the office and need some quiet space, you need to make sure that your coffee maker doesn’t make too much noise. These things are easy to find out, as long as you read the specifications carefully before buying an actual machine. The timer is very handy, especially if you are new to brewing your own coffee. For example, if you want your coffee to be strong, you need to be able to control the brewing time. The experienced coffee lovers find this quite useful as they can always get the taste they like. Also, many coffee makers have programming options. This means that you can set the turn on/off time and have your coffee ready the moment you wake up. Here is one more feature that coffee enthusiasts find very important. The brew strength affects the taste of your coffee. If you want to be able to have a strong cup of coffee, you need to make sure that your coffee maker actually can produce it. How many times have you burned your tongue because the coffee was too hot? Imagine that you don’t have time to wait for your coffee to cool, but you can’t adjust the temperature so that it isn’t too hot. This is nothing but frustrating. Some coffee makers have the option of controlling the temperature. If you prefer very hot coffee, you can easily adjust it and vice versa. Keep this in mind, especially if you don’t have a lot of time to spend on making the coffee. Where should you put it? The good news is that there are very small coffee makers that you can fit almost anywhere. If you know that you have enough space on the counter, you can relax then and look for bigger models. Also, in case you want to bring your coffee maker when traveling, you should choose portable ones that don’t take too much space. Last but not least is the capacity of certain coffee makers and their ability to fit different cup sizes. There are some models that are limited in size. If you want to fill your travel mug, for example, you may not be able to do that. This really depends on the model. Stay assured that there are enough different models on the market for you to find exactly what you need. 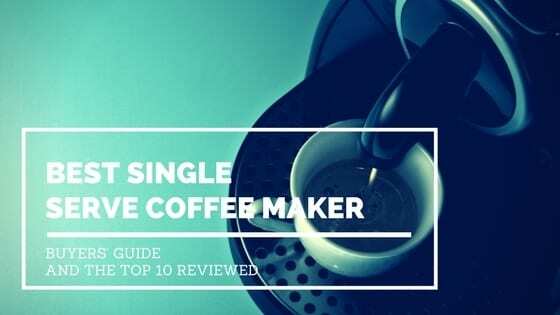 Before you decide to find your best single serve coffee maker, you should know the difference between the single serve brewers and the DRIP coffee makers. Here are a few questions that will help point out the main features of both products. If you are using single serve brewer, this really isn’t a question. It’s usually determined if you are using K-cups, for example. Just put it in, turn it on and wait. Drip coffee brewers, however, require you to choose the amount of coffee you want to make. Normally, you wouldn’t be making just one cup of coffee with these. How much you get depends on how much you put in. You also have to balance between the amount of water and coffee in order to get the preferred taste. If you are not too experienced, it may be a bit frustrating in the beginning. Single serve brewers sometimes take less than a minute to brew. If you’re in a hurry, this is the perfect solution. Drip coffee brewers will take slightly longer – around 4 or 5 minutes. This is still not too long, if you have time to wait for it. Maintenance, in this case, includes the preparation process and the cleaning afterwards. With the single serve brewer, you just have to turn it on, put the coffee in, press the button and wait. There is little mess afterwards for you to clean. The entire process is largely automatic and doesn’t require a lot of your input. Drip coffee brewers need you to be more active and figure out the amount of coffee and water you need. You also have to use filter each time and clean up afterwards. The process is a bit longer, but drip coffee is still the most popular in America. Nowadays, you don’t have to wait in lines to get your ideal cup of coffee. Modern coffee makers deliver good quality with very little effort. You can save time, money and energy by making your coffee at home. Single serve coffee makers are perfect for people who want their coffee fresh and tasty. If you choose a model that is fully programmable, you might even wake up to your cup of coffee. The variety in models is great which means that everybody can find exactly what they need. It may be a small, portable coffee maker or a professional, energy-efficient one. In the end, it only matters that you can enjoy your cup of coffee whenever you want.